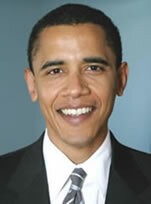 In 2005 Barack Obama, a Democrat, was elected a senator from Illinois. He quickly became very popular and a rising star in American politics. He was born in 1961 in Honolulu, Hawaii. His father was from Kenya and his mother from Kansas. They had met as students at the University of Hawaii. When Obama was very young his parents divorced. His father went back to Kenya to work in the economy and his mother remarried and moved to Indonesia. When Obama was 10 his mother sent him back to the United States, He studied at Columbia University and later on attended Harvard Law School. In the year that he got his degree he married Michelle Robinson. The couple have two daughters, Malia and Sasha. Obama became a civil rights lawyer in Chicago and also wrote a few books. In 1996 he was elected to the Illinois State Senate. In the 2004 elections he beat his Republican opponent by big margin. In 2007 Obama announced that he would become a candidate for the Democratic nomination.